Greater love hath no man that this that a man lay down his life for his friends. The Biblical quotation from John 15:13 (King James Version) is fairly standard for a military memorial, but what what caught my eye was the decorative motif at the top of the marker. The open book and downward pointing finger motif is common enough, as is the inscription on the left open page: “Asleep in Jesus.” What is unusual is a rather rougher-carved version of the Newfoundland Regiment caribou insignia. Many of the Newfoundland Regiment markers you will see in NL graveyards, or in war cemeteries in Europe, follow a fairly standard style. The carving on Norman’s marker is different, and I was curious to find out why. William Charles Norman of Clarke’s Beach did not show up in any of my first searches of the Regimental Records. An internet search revealed the reason why: William C. Norman had never been in the Newfoundland Regiment. 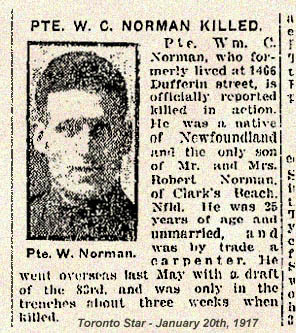 Instead, Norman, a carpenter, had been living in Toronto at the time of his enlistment. He was 5' 6 1/2" tall with a fair complextion and blue eyes. According to his attestation papers, he had served in the Queen’s Own Rifles for 20 months previously, and was assigned to the 83rd Battalion (Queen's Own Rifles of Canada) as part of the Canadian Overseas Expeditionary Force, regimental number 669305. He signed up January 25, 1916 and was sent overseas in May. He served in the trenches for only three weeks, when he was killed on January 6, 1917 as the result of a grenade training accident (premature burst). He is remembered on the Canadian Virtual War Memorial and page 88 of the Newfoundland Book of Remembrance. Norman was buried in the north-east section of the Bajus Churchyard, Pas de Calais, France, and is listed as serving with the 3rd Battalion Canadian Infantry (1st Central Ontario Regiment). His marker in Clarke’s Beach, designed by Chislett’s Marble Works of St. John’s, was probably arranged by his mother, Emma Jane Norman, upon the death of her husband Robert James in 1927. Emma survived husband and son by a number of years, passing away February 11, 1941. The Newfoundland Regiment carving remains a bit of a mystery. Was it inscribed by Chislett's, unaware that Private Norman had served in the Canadian Forces? Or was it added later by someone locally, perhaps by someone unfamiliar with the specific meaning of the insignia? If you know anything about this story, email me at dale@dalejarvis.ca. May 24, 2017: UPDATE HERE!